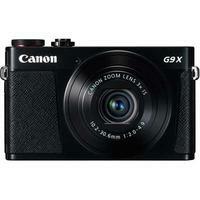 The PowerShot G9 X, in keeping with the rest of Canon's G series, has been designed to offer the benefits of a compact, take-anywhere camera with many of the features, functions and performance of a DSLR. Slim and stylish, this pocket-sized powerhouse has a 28mm wide-angle f/2-4.9, 3x optical zoom lens, a 20.2MP CMOS sensor and the latest DIGIC 6 processor to deliver stunning Full HD movies and breath-taking stills. Wi-Fi with NFC and Image Sync make it simple to connect to your smart device, capture shots remotely and then share or back up your creations. Enjoy creative control with intuitive touchscreen operation and features like a Lens Control Ring and in-built ND filter.